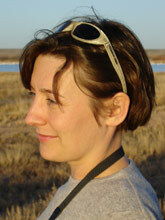 Mikkelsen (PhD UC Santa Cruz 2004) is Associate Professor of Linguistics at the University of California, Berkeley. Her research interests are the morphology, syntax, and information structure of natural language, and the relations among these. She works on Danish (and other Germanic languages) and Karuk, a Hokan language of Northern California. She has worked on noun incorporation, definiteness marking, expletive constructions, relative clauses, and copular constructions (the last is the topic of her dissertation). She is currently investigating verb phrase anaphora, the internal structure of complex DPs and information-structural effects on word order. She has a long-standing interest in philosophy of language and a new-found interest in verbal art.